The South Florida Regional Planning Council has moved to a new website! This website is being maintained by the Council as an archive only. 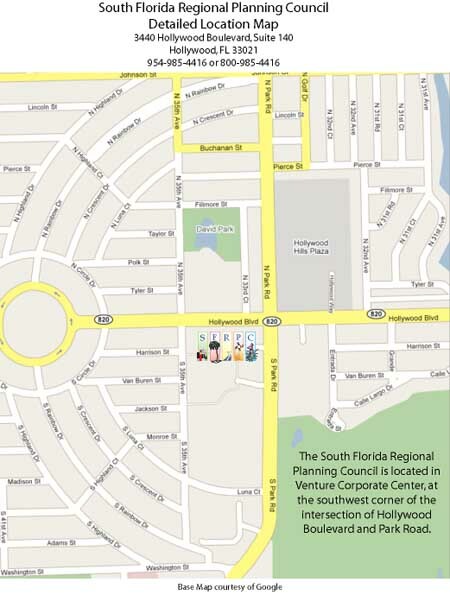 This site and all contents created by the South Florida Regional Planning Council. ADA Compliance Notice: The SFRPC website is undergoing modifications to provide enhanced access to documents for disabled individuals and to comply with the requirements of the Americans with Disabilities Act (ADA) to make reasonable accommodations. If you need assistance accessing Council documents while these modifications are being made, please contact Karen Chang, Director of Administration, at sfadmin@sfrpc.com or 954-924-3653 for assistance. Thank you for your patience and understanding as we implement these changes.